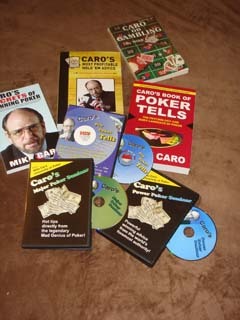 You get it all in this comprehensive Mike Caro selection of his most important poker advice. Here is the ultimate collection, merging text and video, and designed to improve your game monumentally. Find out why so many serious players (even world-class pros) regularly attend Mike Caro poker seminars. Sit back and discover the bankroll-building tricks and tactics of winning poker the easy way — and directly from Mike Caro. Invest in this premier poker education for yourself or buy as a gift for your poker-playing friend or special someone. It’s the legendary “Mad Genius of Poker”, Mike Caro, directly providing winning advice at its best, all gathered into one remarkable, maximum-profit collection for serious poker players.